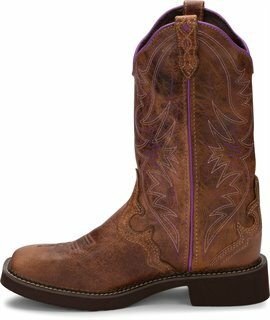 There is a feminine confidence in the Raya Distressed Tan 12-inch tall Women's Justin Gypsy™ cowboy boot. 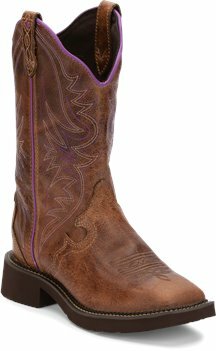 Its stonewashed golden brown leather exterior gives this boot a lived-in look and is accented by a delicate and vibrant lilac stitch and seam on the collar. Made for comfort and fashion, this cowgirl boot has a wide square toe, rubber outsole, and J-Flex Comfort System® insole with a removable orthotic inserts providing a relaxed fit and added support.